The Brushless DC Drives library enables engineers to develop and quickly assess the performance of a complete electric drive, including the motor, the power electronics and the control software for speed and torque control. Models enable the validation of energy consumption for complete cycles and to estimate overload capabilities based on thermal models. The library offers models with a varying level of complexity, from DC-equivalent machine for fast computation and overall system simulation, up to detailed models to study, for example, voltage and current ripple effects. Moreover, standard brushless DC motor characteristics from supplier datasheets can be easily transferred to the library in order to assess the performance of existing motors in the system. The BrushlessDCDrives library is intended to assist the process of designing drivetrains containing brushless direct current motors (BLDC). It covers the key components of a BLDC drive system in different levels of detail, e.g. physical, switched and averaged. 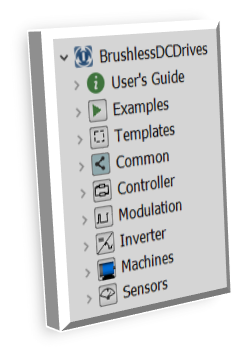 Simple coupling with other technical domains (mechanical, thermal) with the high flexibility of ModelicaParameters and models can be added by the user extending and specializing the functionality of the library (similar to the EPTL).